The remains of houses, bits of charcoal, and rarely seen types of pottery are tantalizing new clues in one of the more persistent mysteries of Southwestern history: What happened to the culture known as the Hohokam? Best known for their hulking adobe complexes, like the ruins now called Casa Grande, the Hohokam were one of the Southwest’s most complex and influential societies, constructing irrigation canals that turned parts of the Sonoran Desert into farmland, and trading with distant Mesoamerican cultures whose influence can still be seen in Hohokam ball courts. 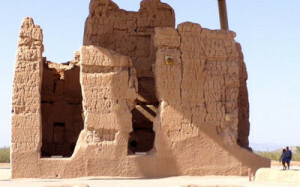 The caliche “Big House” at Casa Grande Ruins in Arizona was built near the zenith of the Hohokam culture in the 14th century. By the late 1300s, the Hohokam were perhaps the most populous cultural group in the Southwest. But around this time, something triggered their precipitous decline. While the cause — or, more likely, series of causes — remains poorly understood, Dr. Deni Seymour says she has turned up an important clue: Despite what most scientists have believed for decades, the Hohokam were not alone. Years of research in southeastern Arizona, the heart of the Hohokam homeland, have turned up what Seymour calls “abundant evidence” that another tribal group — the O’odham, whose members still call Arizona home today — lived in the region perhaps as early as the 1100s. This flies in the face of scientific convention, which has held that the region was essentially vacant between the fall of the Hohokam in the late 1300s and the arrival of the first Spanish missionaries in the mid-1500s. “Some of the big questions scholars have been asking for a very long time are: What happened to the Hohokam? Is there a relationship between the Hohokam and the O’odham? In other words, did the Hohokam become the O’odham?” said Seymour, an archaeologist with the Jornada Research Institute in New Mexico, and a specialist in early O’odham and Apache cultures. 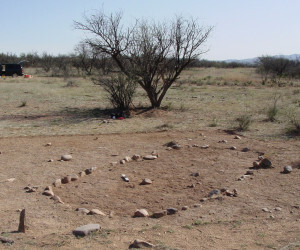 In a paper recently published in the Old Pueblo Archaeology Bulletin, Seymour describes her investigations of sites inhabited by a people known as the Sobaípuri, a branch of the O’odham whose descendants are now part of the Tohono O’odham. Their traces are found mostly along the San Pedro, Santa Cruz, and Gila rivers in southeastern Arizona, where the Sobaípuri irrigated crops and constructed settlements in rows of elongated houses. Some of the sites had been excavated before, in the 1950s and ’60s, revealing evidence of the Sobaípuri’s signature oblong building style and plainware pottery. But using ethnographic accounts, historical records, and the dating technology available at the time, most experts estimated that the Sobaípuri lived in Arizona no earlier than the 1540s, around the time that the Spanish arrived. For her research, however, Seymour turned to new methods. One of them, called thermoluminescence, can pinpoint the last time a material was heated to a certain temperature; another, optically stimulated luminescence, can isolate when particles like quartz or feldspar were last exposed to light. Together these technologies can help date objects like cooking pits, identify when pottery was fired, and determine how long some sediments have been buried. Using this suite of techniques and radiocarbon dating, Seymour said, the more samples she looked at, the more “unusual and unexpected” the results became. 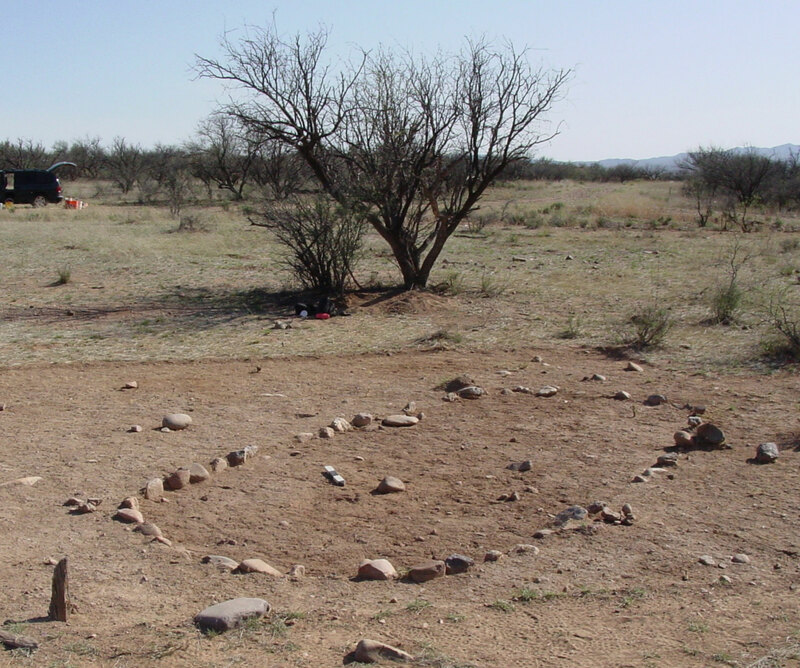 At one settlement near a tributary of the Santa Cruz known as Sonoita Creek, fragments of Sobaípuri pottery dated by luminescence, as well as carbon-14 dating of charcoal, yielded dates from the 1400s. “This site dated 150 to 200 years earlier than anyone was saying, so I was very surprised,” she said. At another nearby site, sherds of more Sobaípuri pottery were similarly dated to the 15th century. These and other locations also turned up plainware that was made by the Sobaípuri but had been traded to other, mobile groups. Some of these pieces, too, dated to the 1400s. It was when Seymour and her team began testing samples from the San Pedro valley, however, that they found themselves going back even deeper in time. At the ruins of a settlement known as Santa Cruz de Gaybanipitea, a collection of pottery sherds returned dates in the late 1200s. And in another nearby site, a separate set was dated to around 1150. At the very least, she noted, these findings suggest that the timeline of occupation in the far Southwest may need to be rethought, with the O’odham inhabiting the region centuries earlier than had been thought — and perhaps more importantly, with their occupation coinciding with the waning days of the Hohokam. If the Sobaípuri lived in southern Arizona before, during and after the Hohokam collapse, she said, it becomes more likely that that they had some kind of role in, if not the collapse itself, then at least its aftermath, such as absorbing some of the Hohokam into their communities. “With abundant evidence of dated Sobaípuri settlements along both the San Pedro and Santa Cruz rivers [before the 1500s], we can say with relative certainty that the Sobaípuri were present at the end of the Hohokam period, and that they either replaced the Hohokam, absorbed them, or represent a modified form of them — all consistent with oral traditions,” she said. Such a scenario would explain, for example, accounts shared by many modern O’odham of an ancient people moving into the region and “chasing out” the Hohokam, Seymour said, as well as the locally held belief that the O’odham are related to the Hohokam. Of course, there’s no evidence of any O’odham group, including the Sobaípuri, playing a direct role in the decline of the Hohokam, she cautioned. But more investigation into the Sobaípuri and other groups will help clarify the muddled timeline that still surrounds the collapse of the culture that built Casa Grande. “Archaeologists are by nature skeptical — it’s in our training — so many will simply think there is something wrong with the dating, the sample, or whatever,” Seymour said. Your statement, of having “recorded sites with pottery displaying continuous occupation from the Sedentary to Historic periods” is not correct. GRIC seems to only have late (1700s, maybe even just 1800s) O’odham identified. The Huhugam are archaeologically very different from the O’odham. Here it is useful to discriminate between a “continuous occupation” by one people (not demonstrated) and a continuous sequence of use by many different peoples. You…. you have to be kidding, right? This isn’t news- this is you coming in late to the game and figuring something out decades after everyone else already knew, raising your hand to tell the teacher, and excitedly shouting out the answer while everyone else shakes their head sadly. Schoolchildren who go on field trips to the reservations are made aware of the connection between the O’odham and the Hohokam. What a sad confusion of modern politics and ancient truths. The article correctly summarizes our attempts to understand events in the Southwest at the time of the Hohokam collapse. The author of the comment is too bound up in the the modern politics of Native American rights to engage in any discussion of the past as it actually happened. probably. I really appreciate both of these angles. I believe there could be a truth to both sides. I am German Irish and Osage. Genetic fence rider, eh?. i have always believed people were established here. Maybe Life was harder here and cultures didn’t evolve like ours. Maybe we are not so evolved. Many of my friends and myself included dream of going back into the wild. A wild that is hard to find if you take a plane across the US. This comment demonstrates a conflation between oral traditions and archaeological investigation on the part of its author. While I appreciate what the contemporary tribes have to say about their histories, which the author of the article also acknowledges support a relationship, it is not (in this context) archaeological evidence. This article shares EVIDENCE supporting the oral traditions, and makes this quite plain. Mark and Dale – I don’t understand this sniping. If you are familiar with the Hohokam and the Piman peoples, then you should already be aware of plenty of archaeological, linguistic and ethnographic connections between these cultural groups. While the protohistoric period (the presumed transition from the Hohokam to the modern groups inhabiting southern Arizona) is still poorly understood, this do not mean we know nothing. In addition to strong oral tradition (see work by Barnaby Lewis of the Gila River Indian Community), there are antecedents to traditional building construction, similarities of designs (Hohokam pottery and Pima baskets are a good example of this), spatial and temporal continuity, dental similarities, and others. I would not be surprised if the story of the protohistoric period in Arizona was fairly complex (possibly involving other groups, including Ancestral Puebloans or groups in what is now Mexico) but there is little reason to doubt the Hohokam-Pima connection. That is why the American government recognizes these groups as descendants, per NAGPRA and other laws. You have this relationship backwards in your comments. The work by Dr. Seymour, while very welcome, is hardly a “game changer”. Good points all, Brian. I’m no anthropologist but that was my major at ASU in the 70s and I grew up among the Gila & Salt River people. I switched to history and wrote on the Na-Dene during the Spanish & Mexican periods, so this was germane but peripheral. No we don’t know everything, but it seems that you and others are not considering the historical record, which supports the idea there was a discontinuity between the Hohokam and the O’odham. The connection idea is common sense, and I know historians were fallible humans, and could even have been bought. Nevertheless, you’re going to have to disprove them first, and to do that you’re going to have to explain why the O’odham led the Spanish chroniclers to believe that they didn’t know who those people were. You’re also going to have to explain why Coronado found eastern Arizona in 1540-2 a despoblado. You can’t solve the mystery by simply declaring it solved. Vastly more data will be needed before we can say for certain what happened. I believe there is an avocational group that over the last 10 years or so, has been attempting to trace Coronado route through Arizona and New Mexico. It seems they’ve recovered several 16th century crossbow boltheads from the Kuykendall site in the Chiricahua area of southeast Arizona. They also found several caret-head horseshoe nails at Kuykendall. A number of other 18th century Spanish artifacts were found very nearby, as well as a lead ball comparable to those Coronado types recovered at Hawikku and Kyakima were found at a proposed camp site near Apache Pass. They suggest a trail was used by the Spanish military that ran from the upper San Pedro through the Kuykendall ruins northeast to Apache Pass and on to the upper Gila. I believe this group is claiming that the Kuykendall complex represents the Chichilticale (House/Seat of the Barbarians) ruins mentioned by Coronado. Your read of the Coronado material is unfortunately inaccurate. That group does not have crossbow boltheads, they have metal items that they claim are. Theirs are iron, all others known from the region are copper. They do not have caret-head horseshoe nails, they have shanks of nails, that could be any age. It’s the caret part that is important for placing these with the Coronado expedition, and they do not have these, so they cannot be placed in this time. The lead ball is also not clearly associated with this time period. Jeffrey, according to a recent article I read (not by that amateur group) they now think that Coronado and Niza did encounter people along the San Pedro. The other point to be made is that indeed the Spanish mentioned the Pimans on the west. Then the Sobaipuri immediately to the east followed by the Janos people even farther east. More or less, the Janos are situated between the Dragoons and the playa country eastward beyond the Animas area of SW NM. Thus, Seymour’s study is centered on the area likely used jointly by both the historic Sobaipuri and Janos before the ethnogenesis of the Apache around the late 1600s. Notice I wrote Apache rather than Athabascans. Nevertheless, farther east of the Janos towards the Rio Grand were the Suma people who extended well into Texas. Turning to the narratives of the Coronado expedition, it was written that only along their route had the region been abandoned. Saying, that nearby on either side of their route, there people lived. The truth is I’m not even sure what bearing if any, Seymour’s study has on the terminal Classic period Hohokam culture. This because her study is located well within what is generally understood to be the eastern Salado cultural sphere. You refer several times to the Coronado expedition finding Eastern AZ to be uninhabited. I was under the impression that this region would be referring to the historic Apachería. I don’t understand how it would have any bearing on a Hohokam-O’odham continuity, given that the most important Hohokam centers are not located anywhere near Eastern Arizona, but rather along the Gila River just south of the Phoenix Metro Area, in approximately the same area as the historic Akimel O’odham. Jeffrey, I’m not going to participate in a creden6tials war. Suffice it to say that I am an archaeologist with over a decade of experience in Arizona and have worked with tribal members across the state and am quite familiar with the oral traditions of Oódham/Pima groups. You are correct that there are contradictory claims by historic groups regarding their own connection to the Hohokam. On the other hand, there is plenty of evidence on the other side of the scale (including plenty of oral traditions that do in fact make those connections, as I stated above). It is not clean and neat, but the preponderance of the evidence (and I gave several examples for several different fields) does in fact suggest such a connection. You can disagree with those connections, but the burden of proof is on you to provide additional evidence for your position. I do not have to disprove every conflicting piece of evidence, I already have outlined the preponderance of the evidence. Also, please to not throw out claims about professionals who have “been bought” without backing up your own claims. I know that the Na-Dene and Hopi has had a contentious relationship and have involved experts on each side. I presume this is what you are referencing but such a statement in this context is inappropriate. The evidence I presented are well accepted facts by the broader archaeology/historian community. It is not bought and paid for by anyone. I have not personally been employed directly by any tribal community and have no skin in the fight except for getting to the truth. This sort of claim is referred to as “poisoning the well”. Back up such serious claims or do not make them at all! Sorry for any misunderstanding, I was actually thinking about Procopius, and the truism that history is written by the victors, not about any contemporary “professionals who have ‘been bought. ‘” Likewise my research on the Na-Dene was of the historic period, not their southern migration but their clash with pre-existing groups and the Spanish Empire beginning in he 16th and 17th centuries. As such it was based on their writings of the time. Certainly nothing at all to do with their 20th-century difficulties with the Hopis. That said however, where there is smoke there’s usually fire. You haven’t really explained why the O’odham found it inconvenient to admit their relationship with the Hokokam to the Spanish, but have subsequently changed their minds. And why did the Coronado Expedition find eastern Arizona unpopulated? History and anthropology are complimentary. Take the Bible, which considered as a historical document, implies that archaeologists can find actual locations and study them to corroborate or disprove what was written. We don’t just throw it all out because some of it is hokum. I happen to believe that the Spanish chroniclers were serious men whose work should be given consideration, not rejected out of hand. Brian, If you are familiar with regional politics you would know that a large NSF grant was just awarded on the claim that nobody was present in this area until the 1600s. I would say archaeological evidence that demonstrates a presence is a potential game changer for this reason if no other. I do not see Mark and Dale’s comments as sniping. I agree with them and Jeffrey, there is a difference between archaeological facts and what tribals are saying today. Archaeology can be an independent measure of this, and these new dates can be used either way to say there is a connection or there is not. Besides, wasn’t it Emil Haury who proposed the then unrecognized connection between the Pima and Hohokam in the 1970s? The tribal resolution prepared then established the current tribal position? “Jeffrey, according to a recent article I read (not by that amateur group) they now think that Coronado and Niza did encounter people along the San Pedro.” Thank you Dora, can you cite the journal or post a link? In this context, the “work” of Barneby Lewis and the GRIC cited by Brian is particularly suspect given its timing. I just finished a review of all the literature regarding the theft of water from the GRIC by upstream users for an unrelated history book that I’ve been editing since 2010, it’s all very fresh in my head. In the light of Seymour’s discoveries, I’m planning to conduct an in-depth review of every available Spanish-language archival and published source in order to determine what I may have missed during my previous research. My bibliography includes about 300 items. Generally, I prefer not to get entangled in historic archaeology discussions. Nonetheless, I did notice that that the word has been put out from Tucson that all copper tipped bolts are diagnostic of this era. However, I believe that a number of Spanish iron tipped bolts have been recovered from 16th century contexts in Florida (Luna campsite Pensacola 1559-1560), South Carolina (Santa Elena 1566-1587), and the Governor Martin site which is Desoto’s winter camp of 1539-40. See Waselkov’s ‘Search for Mabila.’ I understand that several lead balls and an Iron pike-head have been recovered at Kuykendall, as well. Still, you are correct about the nail heads as although the general morphology is correct, the heads of all were missing. Eyewitness accounts of Native Peoples along the Coronado Trail from the International Border to Cibola??? Deni (Dora), when are you going to be writing another journal article? I only ask because the last two were so informative. I think that your work with the Sobaipuri is admirable, if not inimitable. I believe I am right in that the Pima language is part of the Aztec group of languages. The Aztecs in the Valley of Mexico originated in what is today Northern Sonora state and Southern Arizona. Just when did they start moving south and into the Valley of Mexico is not known for sure but likely around the 13th or 14th century. but the Tepaneca, a tribe closely related to the Mexica or Azteca, were attested at Azcapotzalco in the central valley of Mexico by the end of 12th century. Although the Mexica were in the general area, they only claimed to have finally established a principality at Chapultepec by the mid 13th century. It seems likely that the Mexica were initially a far more barbaric element of the Tepaneca who later became an independent tribe. Questions surrounding a grand Chichimeca migration from the mythical Aztlan, and questions of the Mexica and Tepaneca role therein have not been resolved or even as yet been adequately addressed. With this said, the Mexica aristocracy did cremate their dead; a trait uncommon in central Mexico and yet shared with the preClassic Hohokam and the Hokan-speakers of the lower Colorado and southern California. Extended- and flexed-Inhumation was a very common burial method found throughout central pre- and post-contact Mexico, as well as among historic Uto-Aztecans in the American southwest such as various O’odam/Pimans and the Hopi. As context the early Classic Hohokam practiced cremation, however extended-inhumation burial which initially appeared in the late preClassic period became preeminent in the late Classic period through the Phoenix basin north of the Gila. There the shift from preClassic/cremation to Classic/inhumation began around 1100. South of the Gila cremation persisted until the end of the Hohokam sequence. Thereafter the Piman burial pattern was exclusively either extended- or flex-inhumation exclusively until the arrival of the Hokan-speaking Piipaa/Maricopa from the lower Colorado in the late 18th century. At the transition of the preClassic to Classic periods the Hohokam culture experienced a great deal of transformative change. Immediately to the north throughout the uplands of central Arizona this period also witnessed the rise of numerous local expressions collectively known as the Central Arizona Tradition. Easy on many of the basic attributes of the CAT were virtually identical to those of the later Classic period Hohokam on the one hand, and the history Akmel O’odam, in the other. The point is although a great deal of fieldwork and new archaeological excavation was done in the 1990’s most of this information has been known in a general sense, since the late 1930s. This is a somewhat complex topic with many issues that can and have easily sidetrack any reasoned discussion. 1] Thereafter the Piman burial pattern was exclusively either extended- or flex-inhumation until the arrival of the Hokan-speaking Piipaa/Maricopa from the lower Colorado in the late 18th century. 2] Early on many of the basic attributes of the CAT were virtually identical to those of the later Classic period Hohokam on the one hand, and the historic Akmel O’odam, in the other. Does anyone out there know who left the horse and camel bones with skinning tools about ten thousand years ago? I’m not sure which particular “horse and camel bones with skinning tools” you are referring to, but it was likely created by one of many bands of paleo-indian groups roaming the continent at the time. The Clovis and Folsom cultures date roughly to that period and are primarily differentiated by their projectile points. Both were nomadic, likely following herds of mega fauna. They may have had seasonal encampments and certainly used natural caves as shelter. Sites and artifacts from this period are rare and there are still many questions to be answered. D- I find it incredibly sad that you spent your Thanksgiving researching actual page numbers from a journal article. I mean, who, except the actual author, would be so incredibly interested, dedicated, and wholeheartedly invested in a comment thread? LISA- It’s how we roll. DORA- I found it and it’s awesome. Amazing that this article has been around 4 years and I didn’t know about it. Thank you very much! Marcos, mathematicians and physicists adore intuition but anthropologists and historians reject it, and between these two lines of evidence there is simply not enough to prove a connection. Seymour and the rest of us are looking at the Coronado Expedition’s chronicles as well as any other shred of evidence to find it but it has so far proven elusive. Consider that the cultural footprint of Hohokam civilization at its zenith covered much of the riparian habitat of southern Arizona including the eastern part, but then it shrank and ultimately vanished. The O’odham still seem to have been waiting in the wings to replace them. With regard to your comment about Apachería, this is my field, and I’ve built on Jack Forbes’ work. Up to and during the Pueblo Revolt of 1680 the Apaches were still recent arrivals learning their way around. They really didn’t start to gain traction until afterwards, so I seriously doubt that the people seen by Coronado in 1540 were anything more than Janos, Jocomes or other ranchería peoples as according to Seymour in 2009 “Evaluating Eyewitness Accounts of Native Peoples along the Coronado Trail from the International Border to Cibola.”New Mexico Historical Review 84(3):399-435. Hi all, thanks for expressing so much interest in my work and thank you Blake for covering it. Joseph- the San Pedro is in still the Hohokam area, a multi-cultural zone. Just east of the Sobaipuri was Jocome territory and then further east is Jano territory. All of it was used by the Apache, and frankly, all of it was used by those other groups…overlapping territories. Dora-my most recent Coronado article is on my academia.edu page, but, then again, that is probably where you found the first one. Katie- thanks, but I try to stay out of these things and let others argue them out. I have, in fact, several other publications on these topics. B & L- I respect your beliefs, but this topic has been long debated in archaeology. We finally have empirical archaeological evidence to address this issue and Dora is correct in that there is no commensurate evidence from GRIC right now. Independently demonstrating a connection between O’odham (which simply means “the people”) and earlier groups is far more powerful than simply claiming it, especially since Haury did originally in modern times propose the connection, though see Di Peso’s position, though not founded in appropriate archaeological evidence. When you say Apache what exactly do you mean? Are you using Apache in a sense to imply the traditional enemies of the Piman, and Puebloan peoples? Instead, do you mean the southeastern most extension of the Pai peoples? Or yet again, do you mean the southwestern extension of the Great Plains Athabaskans? If it is the former usage then the term Apache is rather useless. However, if you intent the latter I would very strongly disagree. As someone mentioned above it was the Pueblo Revolt from 1680 to 1696 that laid the foundation for the Athabaskan (anti-Spanish) takeover of southwestern Arizona and southeastern New Mexico. To this I would add the Janos, Jocomes, and Suma revolts which started in 1683 and 1684 till about 1700. The Jocomes and Janos continued to resist the Spanish off and on until the Pima Revolt and the general collapse of the Tucson to El Paso frontier in the mid-18th century. Its appears as if all the Uto-Aztecans and nonaffiliated groups in this zone picked a side; either pro-Spanish (Piman, Mission peoples, Puebloan) or anti-Spanish (Apache- Pai in the west and Athabaskan in the east). Thus all the various factions were inspired to move to their respective corners; areas they felt were secure and thereby became acculturated along the lines of the controlling party. Another point to be made is that many will insist that the San Pedro in the late prehistoric period falls within the eastern Salado sphere and not the Classic period Hohokam. I have written a lot on all of these topics so I refer you to several papers, most of which are available on my academia page. I refer these to you not to blow you off but rather because these are complex topics that are difficult to address in a paragraph or two owing to the number of interlocking assumptions that must be examined and replaced. In more than one of my books and papers I dispute the issue of “traditional” enemies and I state when I think that “traditional” enemy relationship began. I think it regularly went back and forth between raiding and trading, friends and enemies. Alliances were often more situation specific than they are today. The Pai people are very different from the ancestral Apaches south of the Gila (I also have a book coming out that addresses this). The Chiricahua and Mescalero are very different from the Apaches north of the Gila. The mountain based Apaches are very different from the plains ones, and they may have arrived earlier. 52(2):169-188. This provides a discussion of this same concept of waiting at the edges and then the dam bursts and they ride forth. Not how it happened, according to the archaeology. I would agree and have stated many times, they had to pick a side and if they were anti-Spanish they generally ended up with the people we call Apache today whereas if they settled in missions they became O’odham or Tigua/etc in NM and AZ. 2013 Platform Cave-Cache Encampments: Implications for Mobility Strategies and the Earliest Athabascans. Journal of Field Archaeology 38(2):161-172. 2012 Gateways for Athabascan Migration to the American Southwest. Plains Anthropologist 57(222):9-21. See 2012 Isolating a Pre-Differentiation Athapaskan Assemblage in the Southern Southwest: The Cerro Rojo Complex. Chapter 5 in “From the Land of Ever Winter to the American Southwest: Athapaskan Migrations, Mobility, and Ethnogenesis,” edited by Deni J. Seymour, pp. 90-123. University of Utah Press. 2010 Cycles of Renewal, Transportable Assets: Aspects of Ancestral Apache Housing. Plains Anthropologist 55(214):133–152. I have worked on the San Pedro (top to bottom) for nearly 30 years and I will say that there is Saladoan, Trincheras, Mimbres, and Hohokam, each a local manifestation that differs somewhat from that in surrounding areas, and so this raises the question of the value of culture area designations, but that is too much for here. I think it is misleading to suggest there is just Saladoan based on what I have seen in the field. I am tired today so I apologize if my comments do not make complete sense. These are very complex topics and they require paper length discussions, which is why I keep referring you to papers or chapters where I have spent the time going into detail. Most of the assumptions about the Apache and the Sobaipuri that have been in the literature are wrong, from an archaeological and documentary standpoint. I discuss this at length in “Where the Earth and Sky are Sewn Together” and in other papers and books. You can ask Blake for my email if you need me to send you papers but try the link I suggest and my personal web page. While I do respect your opinion please do not fault me for differing. In this regard I remain unclear as to how you are using the term Apache; specifically. It is as if you’re listing Piman groups native to the southwest; calling them Apache? Again, that usage would not be historically accurate prior to 1700, and I suggest only serves to muddy the waters more. Based on historical records the Spanish used the Piman and Puebloan term as they had; to differentiate one major cultural group from another in Arizona and New Mexico only around the end of the 17th century. I believe the Pimans made this distinction because ‘Apache’ was used collectively to distinguish the familiar and related from the strange and foreign. In this case the familiar was Uto-Astecan speakers such as the Janos, Jocomes, and Sumas; as well as Sobas and Xilones. In contrast the foreign and strange was the intrusive Great Plains or southern Athapaskan speakers shifting in from the east and west coast Hokan speakers shifting in from the west. There is little doubt that the arrival of these intrusive groups, first the Pai and much later the Athapaskan was in response to the 14th century Prehistoric collapse and resulting demographic vacuum. However, the one caveat here is that while the Pai intrusion into western Arizona may have occurred at this relatively recent juncture, Hokan dominance over western Arizona was likely very ancient. Based on the material culture alone the same may certainly not be said for the southern Athapaskans. Historically, the term ‘Apache’ was used to designate Pai and southern Athapaskans. However, it seems that you are not using it to imply an Athapaskan peoples at all? Also in Arizona and southeast New Mexico the use of the term did not become prevalent until after the late 1600s. Much later the term became attached specifically to the widespread southern Athapaskans only. Generally, southern Athapaskins are associated with a particular material culture which is district from that of prehistoric southwestern expressions. As the late Prehistoric culture of southwest New Mexico and southeast Arizona is distinct and rather well understood, I’m not at all sure how the claim of an early Athapaskan presence can be made; unless excavations at large residential sites have recently found 14th century Salado assemblages mixed with Athapaskan ceramics. I do not believe that has occurred. In fact as I understand the archaeology of this region well, quite the reverse has been repeatedly demonstrated. I am not sure how you got the impression that I consider Pima to be Apache. The Apache, O’odham/Pima, and other mobile groups (Jano, Jocome, Manso, Suma, Jumano, etc) in the southern SW were all clearly distinct prior to the mid 1700s. I have been studying these groups for pretty much my entire professional life so I assure you that I am not confused about their identities, either today or in the archaeological record. I am beginning to wonder if perhaps you are messing with me. Seriously? The Pima did not consider the Apache traditional enemies, I argue, until very late (see Delicate Diplomacy; Earth and Sky). I am arguing that there was a wave of Athabascans that did not come down the plains (as have some other scholars before me; it’s just that now we have evidence). The old model (before there was evidence) is that they came down the plains only and then swooped into the SW (read Athabascan Gateways). I do not doubt that some came down the plains and I do not doubt that the Comanche pushed some of them west in the 1700s. It’s just that all the early dates (in direct association with Athabascan material culture) occur in the west (e.g., SE AZ and southern NM). Athabascan Gateways explains why the earliest dates are where they are at. Now the question remains as to whether early dates also occur elsewhere and whether the currently known distributions are an artifact of my research areas or a reflection of reality. Keep in mind, I did not just obtain this evidence and publish it immediately. I have been gathering this new dating evidence for many years and then I carefully constructed the argument, obtaining the new data as needed to fill out the argument (which required climbing a lot of mountains, digging/documenting a lot of features, and running a lot of dates), and only then did I publish it. My archaeological evidence (read Platform Caches; Despoblado or Athabascan Heartland; and Athabascan Gateways; Three Sisters Site) indicates that the Chiricahua and Mescalero were in the southern SW in the 1300s. I would suggest that they might have had a role in the “collapse” of local groups, though now that we have these early dates (from many sites throughout a broad geographic area using different dating techniques in direct connection/association with early proto-Apache material culture) we must look closely at this issue of which happened first and any casual relationships. I see an overlap in peoples (or the material culture left by these peoples), not an open area/empty niche. I think you should start reading my papers on these topics. While my ideas have changed through the years (and even over the past decade) as I obtain new data, I have never confused Pima and Apache. I have always said Apaches and proto-Apaches are Athabascan speakers (though I cannot hear them speak through the archaeological record). Benavidez used the term Apache in the 1620s (published in the 1630s). Late historically only the Pai and Apache have been referred to together and in that one area. I agree wholeheartedly with your statement: “Generally, southern Athapaskans are associated with a particular material culture which is district from that of prehistoric southwestern expressions.” And I have spent most of my professional career distinguishing and defining this difference in the archaeological record (see Isolating a Pre-Differentiation Athapaskan Assemblage). Keep in mind that the Athabascans south of the Gila are very different than those to the north, archaeologically speaking. One reason for this is the Pai mixture to the north and the Jano, Jocome, Manso, and Suma mixture to the south, among other reasons. Once again I refer you to my publications which document the evidence in minute detail, which is far too extensive to document here (read Platform Caches; Contextual Incongruities; and Athabascan Gateways). I have early dates from several sites in direct association with Athabascan material culture. I would suggest you are conventionalizing the problem inappropriately (consistent with the way people have for decades), as I have discussed at length. Why would you expect Athabascan ceramics to be mixed with Saladoan assemblages when so few Athabascan sites have ceramics? 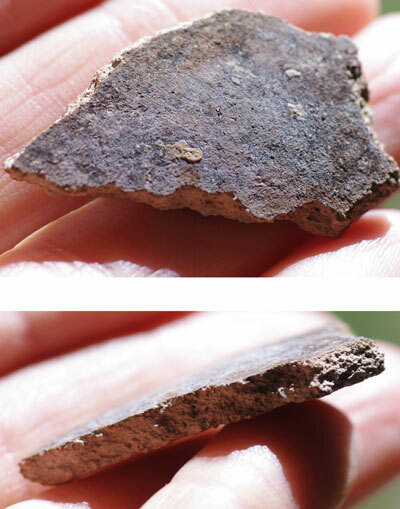 We do not even know if the earliest Athabascan sites have ceramics (this is still a research question, as is the question of changes through time and over space as to what they might look like). We cannot demand that the data be arrayed the way we want them to be for our convenience. We cannot expect mobile group evidence to be expressed the same way it is for sedentary farmers, and, by the way, this is where your expectations are coming from. They did not occupy stratified sites, although we do have evidence of them rearranging rocks and living over prehistoric sites. We must adapt our research orientation to the available data, devising new methodologies and new theory to define and understand these groups. We must recognize that these groups that have been out of reach archaeologically only because we have been too inflexible to address the available data on its own terms. And no, the reverse has not been demonstrated. Received wisdom does not equate to demonstrated. Salado, then empty niche does not fit with the current Apache, O’odham, and Jano/Jocome/Suma data in the archaeological record so I would suggest that an absence has not been demonstrated. My data indicate that pre-differentiation Athabascans were in the southernmost SW in the 1300s. It remains to be seen if I have demonstrated this to you, once you have read the new material. The entire picture of this period has changed in the last decade, now that we have archaeological evidence, not just documentary and linguistics as before, and so one must contemplate these new possibilities that are suggested by the evidence. I recognize this can be difficult to accept given how the prevailing opinion is so entrenched and so many reputations depend on it. Please at least read Athabascan Gateways and the Platform Cache paper. If then you are still confused or disagree, then we will have something to discuss. Deni what you’ve done is simply awesome! I’ve just returned from an extended South American trip and can’t wait to read the rest of your cited papers. You have indeed stretched my mental map by locating the Chokonen and Chihenne already within the Southwest during the 14th century. May I assume since you haven’t mentioned them that your model also includes the presence of the Nedni and Bedonkohe? Or perhaps these groups had not yet coalesced, and are included within the definitions of the larger groups? Once again thanks, I hope that I get to meet you some day! I find it difficult to agree. If I may make four points? 1] What has been repeatedly demonstrated is that the southern Mogollon ceremonially used caves and rock shelters scattered throughout southeast Arizona. These are found from the upper Salt River extending south of the Mexican border. Many were used continuously for more than two thousand years from the southern Mogollon, Hohokam, and Mimbres into the Salado periods. 2] As the proto-historic population of this region was likely related to the prehistoric Salado, we may assume these ceremonial cave sites were also used by the Janos, Sobas Xilones, Jocomes, and others. Clearly the use of these cave sites continued into the Apache period. Thus to find materials outside a deeply sealed context that date to the Salado period, or earlier, mixed with that of the Apache period is not at all surprising. Instead, given the type of bioturbation characteristic of dry-caves and rock shelters together with preservation and reuse of older materials, the mixing of temporally discrete artifacts and other perishable materials is to be expected. 3] Therefore again, I propose the only reliable test of this early Apache/Athabascan theory is to demonstrate through excavation at large residential sites from well sealed contexts, Apache Plainware consistently mixed with Salado period ceramics. That is Salado bichromes and polychromes, White Mountain Redwares, and late northern Mexican polychromes. 4] I propose that evidence for the timing and pace of a large-scale southern Athabascan migration from the northern Great Plains together with Spanish records strongly suggest their arrival in southeast Arizona didn’t occur until late in the 17th century. Although not well synthesized I believe the archaeology from Nebraska, Colorado, and New Mexico is rather convincing in this regard. I applaud your demeanor and style. I respectively will not engage in accolades nor experience, for among many reasons, one,’ am only a somewhat trained amateur from Arkansas, of all things, yet a student of Hohokam region for over ten years. Wrote a 4000 word letter to a friend lately as a general article, trying to share what I have learned and teach respect for the nature of surface artifacts, in this case about the lower Santa Cruz area. My info is thanks to readings from Haury, Edward Dozier and Jake Page, among a few others. Read your article and comments twice, was somewhat upset by some of the tone but much calmer this second go round. Don’t have to be a scientist to appreciate science. Somewhat pleased to hear Haury’s theories still hold up. Am a fan of Ventana Cave write up. Now I have to add Jocome, Janos, Dragoons,Saladoan, Tepaneca and Sobaipuri to my list of study-considerations thanks to you and your critics and supporters. My pleasure. You people just added another thousand words to my follow up letter! Must admit have problems with the comments made by critic of ‘intuition’. Reminds me of similar problem I have had with just a few local archaeologist. if I may suggest that the timing of the prehistoric abandonment of the northern Great Plains and subsequent migrations roughly corresponds to the general period of mass abandonment and migration in the American Southwest. Herein, please note AD 1300 (actually 1275 – 1325) represents the pivotal onset of the more dramatic impacts of the Little Ice Age (AD 1300 – 1850), which of course corresponds to Bond Event 0, an extremely rapid global climate shift from warm and wet to cold and dry. Please review the extensive archaeological literature that outlines the late prehistoric abandonment of the northern Great Plains to include the upper and middle Missouri river basin. Also include a look at the Crow Creek massacre site. This is because the middle Missouri is very likely the region were Apache Plainware was derived, based on its association with the late Woodland ceramic tradition found in that area. it may also prove helpful to simply take a look at the distribution of Athabaskan cultural affiliates in North America, of which the Western Apache represent an intrusion, or if you will, the southwestern most extension into the Southwest. Again, this intrusion south began after AD 1300 when much of the northern Great Plains was abandoned. This is a great discussion. I have also heard that perhaps the disappearance of the Hohokam was due to a series of droughts and floods. Is that still one of the leading theories? Also, after the disappearance of the Hohokam is it accurate to say that the lands they cultivated in the Phoenix Salt River area were uninhabited until the 1800’s? please see Bond Event 0 and the global impacts associated with the onset of the Little Ice Age. Unfortunately,some of this important information hasn’t worked its way into the archaeological literature yet. I just happened to fall into this in the late 90s while researching southwestern radiocarbon dates. You see, changes in the radiocarbon dating curve actually represent changes in the ratios of atmospheric gases, and in turn changes in global bio-mass and global climate. One of the most significant changes in the radiocarbon curve occurred around AD 1300. Basically, relatively recent Greenland ice cores have more or less confirmed this.